Spirulina and the Thyroid – Is it Beneficial? Spirulina and the thyroid are associated together because of one thing, iodine. Iodine plays a crucial rule in the function of the thyroid and the amount of iodine in spirulina can be beneficial. Why is iodine important for thyroid health and function? 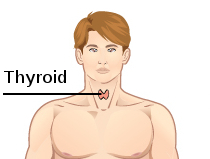 Iodine is NEEDED for your body to produce the thyroid hormone. And these hormones are involved in a number of different activities, ranging from protein synthesis, to enzyme activity, to metabolism. And unfortunately your body cannot make its own iodine, so it is necessary to get iodine through your diet. Iodine deficiency can lead to a number of problems including, thyroid enlargment, hypothyroidism, and even can lead to mental retardation in newborn babies if the mother is deficient due to the role thyroid hormones play in central nervous system development. Iodized salt was introduced in the United States around the 1920’s and this has helped to eliminate iodine deficiency. However, many people avoid eating salt, so these people may be low in iodine and need to get it from other foods. 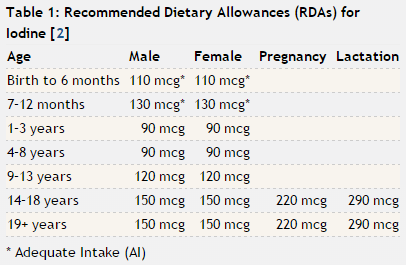 When it comes to your iodine intake, as with all nutrients, you want to shoot for a recommended daily intake number. But whether you fall short or consume too much, it usually doesn’t matter if its not too far off. Seaweeds are among the best sources of iodine out there, and spirulina is one of these so called seaweeds. So how much can spirulina help with your iodine levels? First we need to know how much iodine you actually need. So take a look at this table provided by the US Department of Health and Human Services’ National Institutes of Health. As you can see pregnant women are in a greater need of iodine than other people. And their iron deficiency comes with the risk of harming, not just themselves, but the baby also. How much iodine is in spirulina? Well the iodine content of spirulina varies greatly, and this is the main problem with spirulina supplementation for iodine. May distrubuters don’t make any note of how much iodine their spirulina actually contains, and this can be a big problem. For this reason I only have 1 suggestion. Nutrex Hawaiian Spirulina is one of the only brands that makes their spirulina’s iodine content known. According to their website it contains about 15mcg of iodine for every 3 grams of spirulina. So lets say you are taking a tablespoon (7g) of spirulina a day, which is a rather common serving size. You will be getting approx. 35mcg of iodine out of that serving. If you are 19 years or older this would be 23% of the RDA for iodine. Its enough to make a difference, but not too much where you really have to limit your spirulina intake. 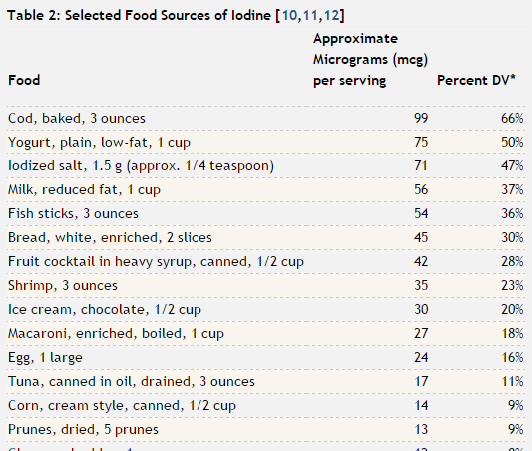 Compared to all these other iodine food sources, spirulina by far has the most concentrated iodine content. It has 23% of the RDA in just 7 grams remember! Its important to mention the sodium content of spirulina, because many people looking for extra iodine are those that stay away from salt. And people stay away from salt due to the sodium content. So just to let you know spirulina is on the higher side of foods with 73mg of sodium for every tablespoon (7g) of spirulina. It is recommended that healthy people consume less than 2300mg of sodium per day. So the amount of sodium in a tablespoon serving of spirulina is only 3.2% of your limit, but its still worth mentioning. Is spirulina beneficial enough to supplement for iodine? This is ultimately dependent on how deficient you are in iodine. But I would definitely say yes it is. You get 23% of the RDA in just one tablespoon. And the iodine content is just one of the MANY benefits of spirulina that can improve your health. Give spirulina a try if need more iodine. You can find spirulina powder here, spirulina tablets here, or spirulina capsules here, all of which products I have reviewed and recommend. If you experience burning sensation of the mouth or throat, fever, nausea, vomitting, weak pulse, or diarrhea this may be due to consuming too much iodine and you should see a health professional.